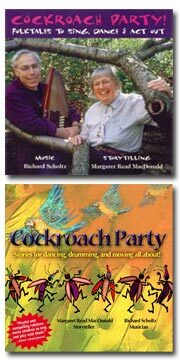 Margaret Read MacDonald and Richard Scholtz are known for their lively audience-participation folktales. MacDonald travels the world, telling and bringing back stories from such marvelous places as Mahasarakham, Kota Kinabalu, and Rio. Dr. MacDonald is a folklorist, children's librarian, and author of over thirty books on folklore and storytelling topics. Her award winning picture books include The Old Woman Who Lived in a Vinegar Bottle and Pickin' Peas. Richard Scholtz enhances the stories with his amazing autoharp technique and the lovely mountain dulcimer. His musical improvisations add an entrancing second voice to these performances. Each telling of a story is different in this blend of parallel storytelling and music duet. Richard teaches music for educators at Western Washington University in Bellingham, Washington and produces tapes and CD's with Tom Hunter, MacDonald, and other musical comrades. Scholtz and MacDonald have performed at the Vancouver Storytelling Festival, The Port Angeles Forest Storytelling Festival, Northwest Teacher Camp, Multnomah County Library Tapestry of Tales Festival pre-event tour, American Library Association Storytelling Evening, The St. Louis Storytelling Festival, and at schools and libraries throughout the Pacific Northwest. 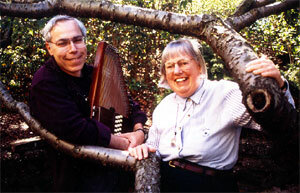 They are featured performers at the 2002 Three Rivers Storytelling Festival in Pittsburgh and at the King County Library System StoryFest International. Voice and auto-harp/dulcimer duets. Lively, playful fare. Fun to expand into singing, dancing, creative drama. Includes the picture book stories, Fat Cat (Denmark) and Mabela the Clever (Limba, Sierra Leone), as well as several stories from Shake-it-up Tales: "Little Old Woman Who Hated Housework" (Scotland); "Conejito" (Panama); "Little Boy Frog and Little Boy Snake"(Ekoi); "Miera, Miera, Meow" (France) and "Telesik" (Ukraine). 1997. With Richard Scholtz. August House, $12.00 (0874835119). Lively musical tellings taper off into gentle bedtime fare in these stories of nesting birds, miniature samurai, and wish-giving fairies. Stories from Tuck Me In Tales ("Snow Bunting's Lullaby" Siberia ; "Kanji-Jo the Nestlings" Mende, Liberia; "Chin Chin Kobokama" Japan; "Playground of the Sun and Moon" Araucana, Argentina & Chile; "Counting Sheep" Great Britain; plus "The Old Woman Who Lived in a Vinegar Bottle" Great Britain. 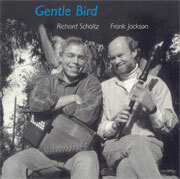 Told by MRM, music on autoharp and dulcimer by Richard Scholtz. "CJ loved COCKROACH PARTY! Made me jealous because he never sits still for me!" ...father, Charlie Williams, "Noise Guy"
Voice and instrument story duets, some gentle, some rollicking. MacDonald tells, Scholtz plays autoharp and dulcimer. A much livelier selection than the bedtime tape, Tuck-Me-In Tales. Includes: "Grandfather Bear" (Eiven, Siberia); Pickin' Peas (Alabama); "Elk and Wren"(Makah); "Cockroach Party" (Louisiana); "Ms. Cricket Looks for a Husband" (Palestine Arab); "Ms. Cricket Gets Married" (Palestine Arab); "Teeny Weeny Bop" (Australia). 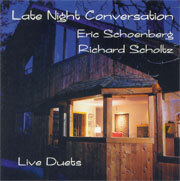 Richard Scholtz has created several lovely recordings in his home studio. He seeks to share the living joys of intimate musical conversations. 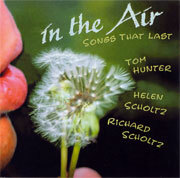 Tom Hunter, Helen Scholtz, Richard Scholtz. Live Music Recording, 1999. LMR 91599. Delicious, informal playing with these old children's favorites. Nationally loved children's performer, Tom Hunter, joins his old friends Richard and Helen Scholtz in their living room for an evening of singing. Contains: Working on the Railroad/Wheels on the Bus/Train Is A-Comin'/Row Row Row Your Boat/Go Tell Aunt Rhody/DoneyGal/Ye Ho Little Fish/Little Cabin in the Woods/I Hear You Buzzin' Cousin/ Eency Weency Spider/Coming Round the Mountain/Old MacDonald/This Old Man/Big Ship A-Sailing/Green Grass Grows All Around/Skip To My Lou/Buffalo Gals/Chairs to Mend/My Bonnie Lies Over the Ocean/You Are My Sunshine/If All of the Raindrops/Put Your Finger in the Air/Everybody Knows I Love My Toes/I Got a Hat/Twinkle Twinkle Little Star Medley. Eric Schoenberg and Richard Scholtz. Live Music Recordings, 1997. Schoenberg on guitar, Scholtz autoharp and dulcimer. Conversations between Eric's guitar and Richard's autoharp or dulcimer. Contains: Wild Mountain Thyme/ Peacock Feathers/Auld Lang Syne/Bye Bye Blues/ Heart Like a Wheel/ Captain O'Kane/ Afofuni/ Ki Ti Nam/ Straw that Broke the Camel's Back/ In the Csitari/ Mountain Foothills/ Planxty Irwin. Richard is a collector of beautiful tunes and a master of milking the richest nuances of those melodies on the autoharp and dulcimer. Eric is probably best known for his great guitar arrangements and beautiful tone. They both share a love of melody and have an endless inventiveness and interest in how counterpoint and chords change the feel of a melody. Contains: Hector the Hero/ Halting March, Bonapart Crossing the Rhine/Priadeaux Haven/Papirossen-Saméach T'samach/Bolivianita/Chiquita Linda/Lea Rig/Gentle Bird/Saint Anne's Reel/An Italian Air/Cradle Song/Ovinu Malkénu.